(Nanowerk News) The protein p53 is a key player in tumorigenesis, controlling diverse genes that regulate cellular growth and DNA repair, and acting as an ‘early responder’ to cellular stress by killing off cells at risk of serious damage from toxic chemicals or ionizing radiation. As such, understanding the various modes of p53 regulation represents a full-time effort for many scientists. Recent research has illuminated a surprisingly important role for tiny RNA molecules, known as microRNAs, in downregulating the production of a variety of proteins, and Bing Lim of A*STAR’s Genome Institute of Singapore recently partnered with Harvey Lodish’s group at the Whitehead Institute in Cambridge, Massachusetts, USA in an effort to tease out the role of microRNAs in managing p53 levels ("MicroRNA-125b is a novel negative regulator of p53"). As microRNAs work by binding complementary nucleotide sequences on target RNAs, the researchers began by searching a database for known microRNAs that might bind p53 messenger RNA. The most promising candidate was miR-125b, which is evolutionarily conserved in species ranging from worms to humans and has been previously shown to be overexpressed in a variety of cancers. The microRNA recognition site is located within an untranslated regulatory sequence of the p53 RNA, and grafting this sequence onto non-p53 RNAs proved sufficient to inhibit protein production. Cells with elevated levels of miR-125b produced less p53, and exhibited lower levels of p21 and Bax—products of genes activated by p53. Overexpression of this microRNA also blocks p53’s capacity to prevent cancerous growth by inducing cell death in both cultured cells and even in whole organisms. 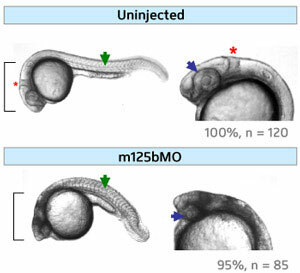 “miR-125b alone is able to confer resistance to irradiation in zebrafish embryos by suppressing DNA damage-induced p53 activity,” says lead author Minh Le, a member of the Lim laboratory. The researchers are following up on these other targets, which may offer further new insights into microRNA-mediated control of the various cellular pathways coordinated by p53. “Before this, nobody had revealed the regulation of p53 at this level,” says Le.